(IOWA LUCAC GLANCES cont.) 2. MAN AND WOMAN OF THE YEAR: Humberto Jimenez, Gloria Mendez, Tommi Briseno SCHOLARSHIP: Lupe Reyes, Henry Vargas, Bill Rocha RESOLUTIONS: Jesse Guzman, Jesse Mosqueda, Ernest Rodriguez PARLIAMENTARIAN: Ernest Rodriguez STATE DEPUTY DIRECTOR: Deputy Director Ila Plasencia, Des Moines, gave a report on Project Equality which is an organization composed of all religious groups for the purpose of promoting the hiring of minority groups. Names of all firms and organizations participating in this program are compiled in a book and published for the use of Project Equality. LUNCEHON: Invocation was given by Mr. Max Busto, Minister for the Spanish Menonite Church. Distinguished guests were: Nick Reyes, Mexican-American Anti-Defamation Committee; Wash, D.C. Gilbert Pompa, Associate Director with U.S. Dept. of Justice Jim Silva of U.S. Dept. of Labor Manpower Administration Manuel Vargas, District Director; Illinois Ernie Lopez, Illinois Migrant Committee Sam Bell, Human Resources Committee Honorable Manuel Banales, National President of Junior Lulac; El Paso, Texas GUEST SPEAKERS AT LUNCHEON: MANUEL BANALES, National President of Junior Lulac spoke on the growth and expansion of Junior Lulac and the interest shown by the senior councils in the Midwest. The Davenport Junior Lulac Council was well represented at the luncheon and President Banales encouraged them to continue their good work in the Junior council and move right into the adult council when eligible. JIM SILVA addressed the luncheon group, announcing that he was a candidate for national president, and asked for support of the Midwest where the voting power carries a great deal of influence at the national convention. Mr. Silva gave a rousing speech on the barren trail followed by Lulac these past years and stated that the time has come to make a complete change in administrating the affairs of Lulac on a national level. REPORTS OF STATE OFFICERS: DISTRICT DIRECTOR #2 JOHN VASQUEZ of Davenport yielded the floor to LUPE MENDEZ, Pres. of Fort Madison Council #304 so that there would not be a duplication of reports. Mr. Vasquez also yielded the floor to HENRY VARGAS, Davenport, who gave a report on the activities of Council 10. DISTRICT DIRECTOR ALEX PABON yielded the floor to JESSE MOSQUEDA, President of Council 306 of Des Moines, for a report of District #1 and the activities of his council. STATE TREASURER'S REPORT State Treasurer Efrin Gomez, Davenport Council 10, reported that all councils had paid their $33.33 making a total income of $99.99 with disbursements of $85.29. 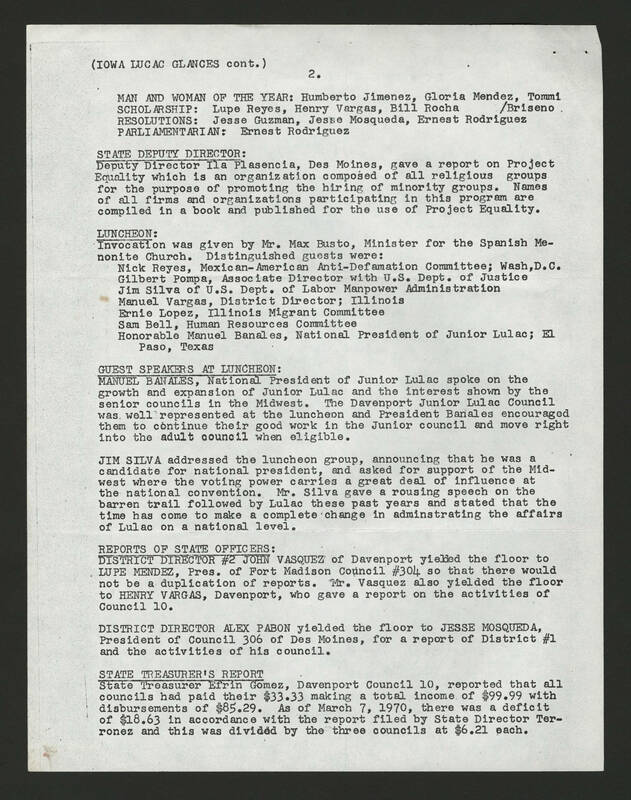 As of March 7, 1970, there was a deficit of $18.63 in accordance with the report filed by State Director Terronez and this was divided by the three councils at $6.21 each.